Having taken a 6-3 lead following the afternoon session, it appeared as though we might be in for an early finish as the Australian won the first two frames of the evening session to move just two away from the magical target of ten. Closing out victory would not be so straight-forward for Robertson however as Allen came back from behind to close to 8-4, before quickly adding the next to keep his hopes alive heading into the final mid-session interval. A marathon, low-scoring frame followed and despite both having a number of chances, it was ultimately Robertson who was able to take it on the colours and from that point there would only be one winner. His first title of the season and biggest win financially since he completed snooker’s triple crown at the 2013 UK Championship, the victory marks a return to form for Robertson after a slow start to the season by his standards. There were signs of his game beginning to come together at the recent International Championship in Daqing and this week he improved throughout the competition to take a deserved win in Coventry. 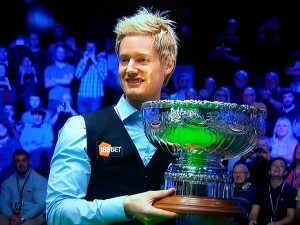 With a significant amount of prize money to defend at the upcoming UK Championship, Neil will need another good tournament at the Barbican Centre if he is to retain his current ranking, but that is for another day and he should enjoy his victory at what is becoming one of the biggest events on the calendar. As for Allen, inevitable disappointment to have lost, but a dignified speech from him in the arena and a good week all in all, which saw him win ten matches dating back to the start of the Bulgarian Open, until his defeat tonight. Overall, I enjoyed the event and the return of snooker to terrestrial television for the first time since the World Championship back in May. Yes, the standard was perhaps not the best and arguably a few too many big names went out early on than would have been ideal for the viewer, but there were still a few good matches and a deserving winner at the end of the week. Neil is such a great champion. What I loved about his story is how he was in the unemployment ‘cue’ in Australia before leaving without signing in – a fateful decision which may have prevented us seeing the glory of his 100 tons in a season record. It is interesting that Neil sights directly under his right eye. The norm in the pro game is to have the cue somewhere between both eyes – with some settling on a middle of the chin position for the cue. What are the head positions of the other pro’s – and what is YOUR head position? !